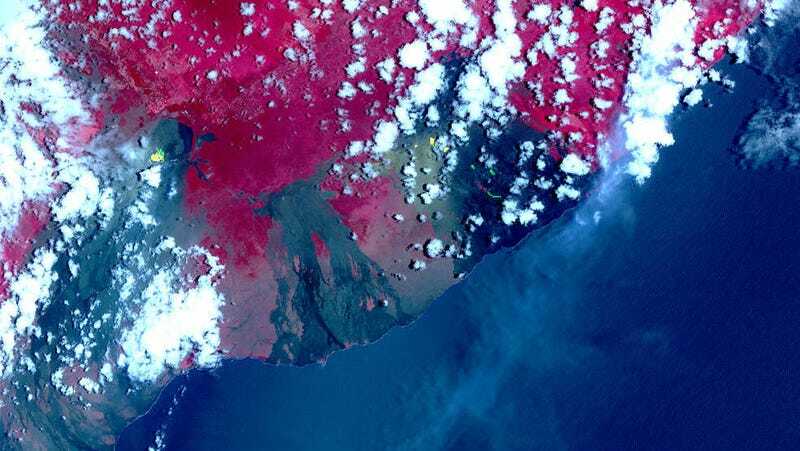 Thermal infrared bands on ASTER, captured May 6, show hotspots from new fissures and lava flows at Kilauea volcano (yellow and green). 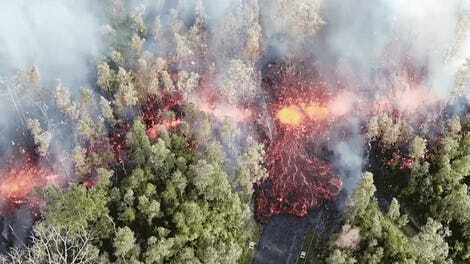 Photos of the ongoing, lava-oozing eruption at Kilauea volcano have been going viral for days. Less attention-grabbing—but equally informative—are the images NASA’s been capturing from hundreds of miles up. On Monday, the space agency released the image above, assembled from data captured on May 6 by a thermal imaging camera aboard the Terra satellite. It shows heat signatures (yellow and green) from newly-formed fissures and lava flows in Kilauea’s East Rift Zone, underscoring that the volcano is producing a truly epic amount of heat for it to be so plainly visible from 443 miles up. Take that, drone footage. Another image captured the same day shows plumes of sulfur dioxide gas—also in yellow and green—from the summit crater and newly-opened fissures near Leilani Estates wafting across the island and out to sea. Sulfur dioxide plumes from the recent eruptive activity at Kilauea are shown in yellow and green. To put those emissions in perspective, NASA’s Earth Observatory also released this image Wednesday, which uses data from the Ozone Mapping Profiler Suite sensor on the Suomi NPP. As you can clearly see, concentrations of the toxic gas, which bubbles out of lava as it’s erupting, have been ballooning across the island. Sulfur dioxide emissoins over Kilauea from April 30-May 5. 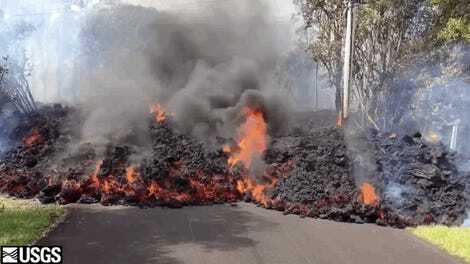 Meanwhile, new cracks in Leilani Estates are continuing to emerge, widen, and spew lava. And while the prevailing trade winds are pushing most of the sulfur emissions offshore for now, NASA notes that if the winds die down, air quality over Leilani Estates could seriously deteriorate. As the Washington Post detailed recently, the volcanic smog or “vog” created by sulfur dioxide can have debilitating health effects. So yeah, things are going to be bad for a while.